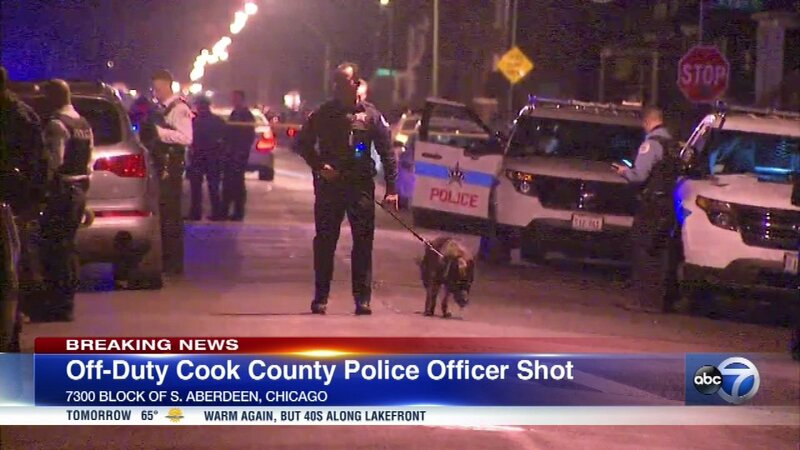 CHICAGO (WLS) -- An off-duty Cook County correctional officer was shot in the leg Saturday evening on Chicago's South Side, police said. The 36-year-old officer was taken to Advocate Christ Medical Center in good condition. His injuries did not appear to be life-threatening, a Cook County Sheriff's Office spokeswoman said. Two people were being sought in connection with the shooting, which occurred at about 8:30 p.m. in the 7300-block of South Aberdeen. Police said the victim was standing outside a residence when two suspects emerged from a vacant lot and fired in the victim's direction.